When you start learning Arabic alphabet, you will find a group of letters that have similarity in pronunciation. Letters Dhad ض and Tha'a ظ is an example of this similarity. Maybe the confusing isn't that much in reading, but it becomes harder when you try to write a word and can't figure out if it has Dhad ض or Tha'a ظ letter!! This problem happens to both who are learning Arabic as a foreign language and to Arabic native themselves. 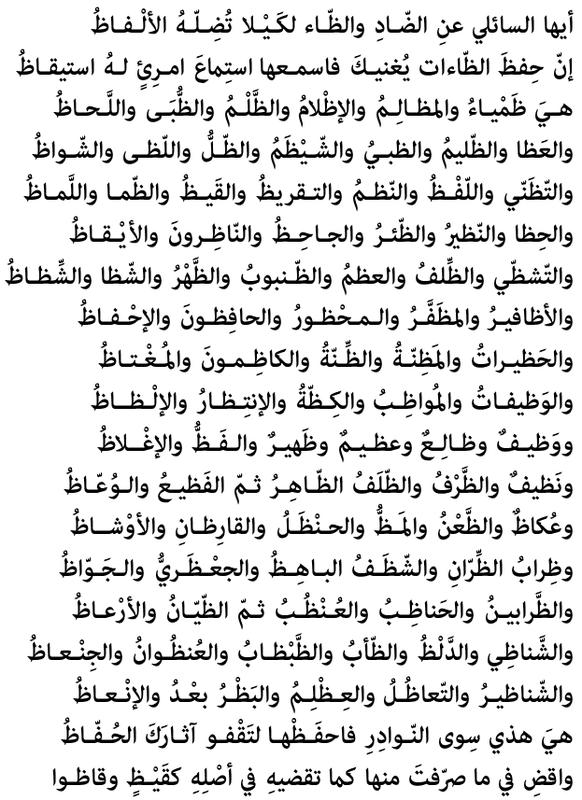 An Arabic poet called "Al-hariri الحريري" wrote a poem and use all the words that have Tha'a ظ letter to help others differentiate between Tha'a ظ and Dhad ض. Because when you know all words with Tha'a ظ , obviously any other words would be with Dhad ض. This poet "Al-Hariri الحريري" lived in 10th century, and since many vocabularies that are used in his poem aren't that common nowadays, it is important to update his list with common vocabularies that are used nowadays. Also, see the movie in the end to demonstrate these words (that have Tha'a ظ) with a pronunciation. First of all, you need to know that you DON'T have to pronounce these two letters exactly as ancient Arabs did because no one does unless you want to learn how to read the holy Qur'an, in that case there are people specialist in this field. 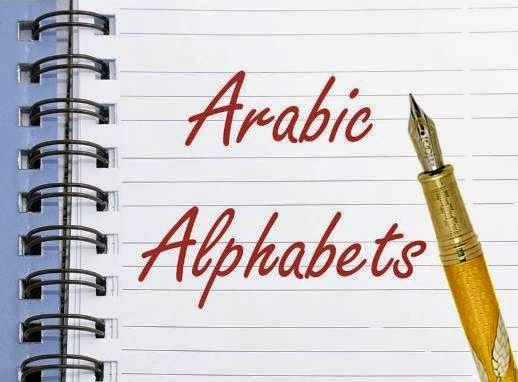 When you learn Arabic, you need to pronounce these two letters in a way most people do so you can read and write perfectly and your speaking would be as a native speakers. See the movie below to hear the pronunciation. I know if I told you that the "practice is the key" you'd like probably to kill me. So instead, I'll tell how to practice. One of the best advice came from the famous poet, Al-Hariri (1054–1122). He suggested to memorize (or learn) all words that have the letter Tha'a ظ and in contrast any other word would has Dhad ض. He wrote a poem that gather all these words, with Tha'a ظ, in Maqama called "المقامة الحلبية =al-maqama al-halabiah". Since he selected some of very odd and unused words, It'll be better to put a list of most common words nowadays. The next step is read those words, in the next section, and watch the video for pronunciation. Then use cards or stickers to post these words in a place you could see them most of the time. This place can be a wall in your house, office, car..
4- What About Words with letter Dhad ض ?!! After you memorize the words in the previous list, any other word would has Dhad ض. So you don't need to memorize words of the letter Dhad ض . - If you have any question or comment! Please use the comment form bellow and I'll get back to you as soon as possible. Let's say a person "X" works in medical field. Obviously, he has to deal with many vocabularies that used in everyday medical. The person X also needs to use these vocabularies to communicate with patients and people who need some kind of help. Let's think where do these people come from?!! Exactly, they come from everywhere and from every nationality.. and if the person "X" wants to work in Arab country, most the patients would be obviously Arabs. We in EVERYDAY ARABIC commit to give you Arabic language that actually used in everyday situations. This post is a start point for those who are interested or work in medical field. 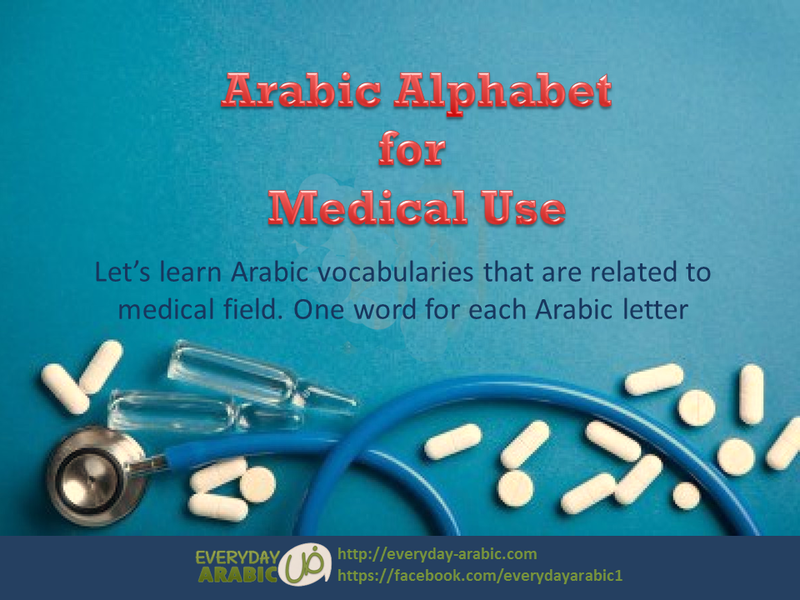 These Arabic alphabet comes with examples of medical vocabularies (or related to). Use the audio embedded for pronunciation. * Arabic alphabet are ordered in 6 groups according to similarity of calligraphy, which is the best way to learn Arabic alphabet. 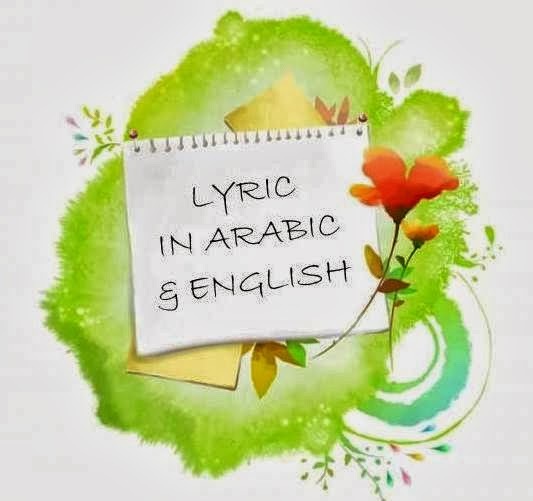 Are you work in Arabic country and need to learn dialect Arabic to use it in communication or business! Let us help you in private online lesson and start with free session, read more details.. If you have any question or suggestion, we'll happy to help and hear. Contact us or leave a comment here.